Going up to Fengguizui a couple of weeks ago, we found that they had added bike paths along Jingye Rd (敬業路) (runs next to the shopping area at Jiannan MRT stop) since we last did this ride a couple of months ago. 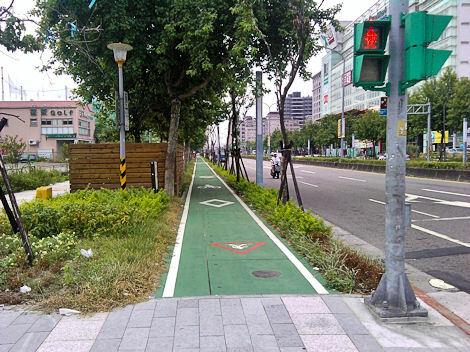 This is of course what they should have done with the bicycle lane along Dunhua Rd, placed the bike path on the side walk instead of on the road, so that motorcycles and cars couldn't drive and park in it. This is a previous rant about the Dunhua fiasco, and so is this.